This chart covers the week commencing January 7th to January 14th. 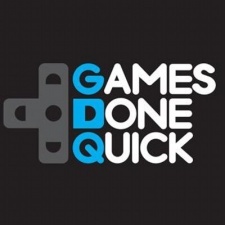 Twitch channel GamesDoneQuick is topping the chart this week after a successful run of charity streams. The week-long event takes place every year and sees players come together to attempt speedruns of their favourite games. Over the week, the GDQ Twitch racked up over 18.4 million hours watched. In second place we have FaZe Clan member and Fortnite extraordinaire Tfue. The streamer is growing rapidly, racking up 2.8 million hours watched this week. Ninja takes third this week, after a 25.2 per cent drop in his views. The creator recently began dabbling in Final Fantasy XIV, which doesn't seem to resonate with his audience quite as Fortnite does. 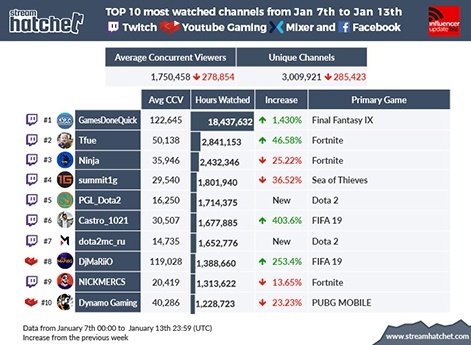 Twitch streamer summit1g is in fourth after a 36 per cent drop in views last week. A new entry in fifth is PGL_Dota2, a Dota-focused Twitch channel that racked up over 1.7 million hours watched last week. Another fresh entry in sixth is Castro_1021, a Twitch creator focusing on FIFA 19. The streamer's views increase by 403.6 per cent last week. He's closely followed by Dota2mc_ru, the Dota coverage channel. The first of two YouTube channels takes eighth place; the FIFA focused DjMaRiiO comes in after a 253.5 per cent increase in views last week. 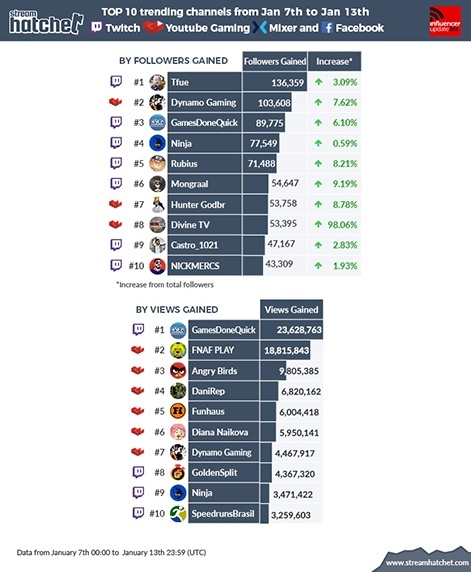 Twitch channel NICKMERCS falls down to ninth from sixth after a 13.6 per cent decrease in views. YouTube channel Dynamo Gaming closes the chart this week, falling from seventh last week. A 23.2 per cent decrease in hours watched meant the PUBG Mobile focused channel racked up over 300,000 less views last week. Tfue is leading the trending by followers chart for last week. As well as racking up 2.8 million hours watched, the Fortnite star also drew in another 136,359 Twitch followers. Dynamo Gaming and GamesDoneQuick follow behind after gaining another 103,608 and 89.775 followers respectively. Other entries include YouTube channel Hunter Godbr, who racked up an additional 53,758 YouTube subs last week, and Divine TV, who gained another 53,395 - an increase of over 98 per cent in just one week. Naturally, GamesDoneQuick is topping the trending by views chart. Non-stop broadcasting combined with a popular annual event means that the GDQ Twitch racked up over 23.6 million views. Second place in this chart goes to YouTube channel FNAF PLAY, a YouTube channel amassing big hits with Five Nights at Freddy's videos. Other entries include the official Angry Birds YouTube channel, as well as regulars Funhaus and Diana Naikova. Newer entries include Twitch channel GoldenSplit which recieved over 4.3 million views last week, and Spanish YouTuber DaniRep who brought in over 6.8 million hits.